If the 2014 tea leaves are being read correctly, once again the New York State Senate will approve their version of the MMA bill while the Assembly will do nothing and let theirs languish and die - a familiar turn of events that leaves us in the usual position of having tons of amateur shows to go to but nothing of the pro variety. It doesn't take a keen political analyst to see that proponents of sanctioned MMA in New York have reached an impasse in the legislature, and that it's likely some radical course correction or change in tactic is required. But what should be done exactly? And what is the underlying problem preventing New York from joining every other state in sanctioning mixed martial arts? The answer to the latter question can be found in the annals of recent history, and the "legalize MMA" rallies that were held in Manhattan in 2011 and 2012. At those gatherings, fighters, coaches, promoters and fans alike claimed a portion of sidewalk real estate in front of legislative offices and made their opinions known to all who passed by. The rallies were held midweek, so there were businessmen on those streets then, as well as soccer moms, blue collar types - a relatively fair cross section of New York. And curiously, what was most telling of the sport's plight in the state was that the vast majority of passersby had no clue that pro MMA was actually banned here. Of all who walked those downtown and midtown streets, maybe just 15% had an inkling that pro fights were against the law. As for everyone else who strode past the rallies, well, UFC press conferences in Madison Square Garden and Radio City Music Hall, fan events in Herald Square, and countless fights aired on various easily-accessible television channels had left them with the impression that the sport was happening unrestricted everywhere. In other words, MMA may be big and mainstream, but not so much that everyone knows what's going on in it - especially not in New York. Right now, the greatest enemy to the UFC's cause isn't the Culinary Union or legislators on the take. The greatest enemy is the ignorance and apathy of voters on the issue, which is allowing their legislative representatives to weigh in (or not) how ever they see fit. If Assemblyman Whatshisname has received only a half dozen emails from elderly constituents calling "ultimate fighting" barbaric, and has a Culinary Union rep buying him lunch at Angelo's 677 Prime whenever he's in Albany, then for sure he's going to let the MMA bill die in the Assembly year after year. But if that same politician is suddenly flooded with opinions - educated opinions from those who voted him into office - it's going to be much harder for him to dodge the issue. The casual fan knows MMA has evolved from what it was in 1997 (when the MMA ban was put in effect), and that same fan very likely knows why there hasn't been a UFC at Madison Square Garden yet. But in terms of sheer numbers, the support of the casual fan isn't enough to get it done. The general public needs to weigh in. And to do so, they have to at least know it's an issue. Which is why, to dispel the pervading myths and educate the masses on the state of MMA in New York, the folks at the UFC need to do something that could be considered a crazy idea. 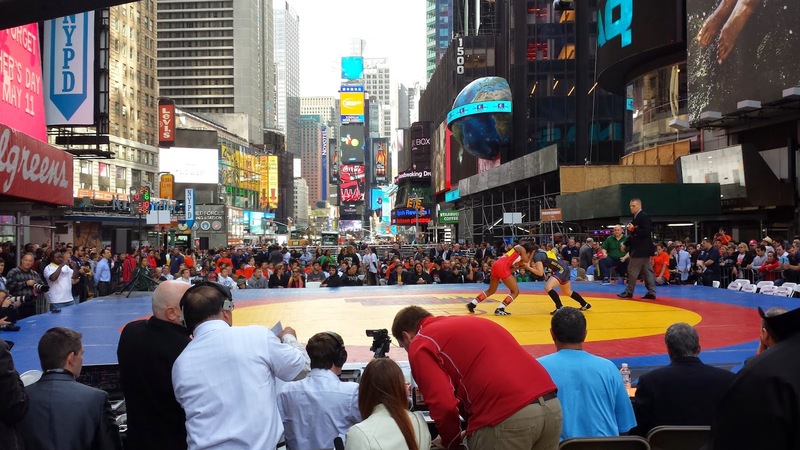 The UFC needs to hold an amateur MMA event in Times Square. It doesn't even have to be Times Square. Herald Square, Union Square, Central Park, or even just a portion of the Highline will do. The point is to create a very public spectacle, which in turn will create a storm of media attention - a level of attention far greater than anything garnered by press conferences in the Legislative Office Building or in the atrium of MSG. In February of 1997, all the major New York City newspapers ran multiple-page spreads on UFC 12, which was held in Dothan, A.L. Can you imagine how much ink - real and digital - would be devoted to a UFC in Times Square? Would there be outcry? Doubtful. But even if there was, outcry would breed discussion and discourse, and discussion and discourse are the antithesis of ignorance and apathy. The sport, with its growth and maturity and popularity, is strong enough to withstand the harsh words of uneducated talking heads. Besides, the sanctioned MMA movement's biggest enemy is not enough words are being spoken on the matter. This would fix that in the grandest way possible. Thanks to Zuffa's lawsuit, the State Attorney General has acknowledged that amateur MMA is 100% legal, so if the UFC were to stage such an event literally tomorrow, it would be well after nearly a hundred of them have gone down without a hitch in the state. An amateur UFC sanctioned by, say, the World Kickboxing Association - an organization that has been sanctioning shows here for years - would be bulletproof, and any politician determined to open fire via public opinion or court injunction would be opening himself to withering return fire. Without a doubt, there would be absolutely no shortage of aspiring fighters willing to scrap at a UFC-branded event. And there would be no shortage of fans there to cheer them on. Could such an "in your face" ploy hinder the lobbying efforts that the UFC has spearheaded over the years? Would an Octagon set up in the middle of Manhattan, swarmed by tourists and voters, threaten whatever house of cards of legislative support that's been carefully erected? Honestly, if the issue is one that requires such a delicate hand, then the hands that have been working on the matter thus far have either been too gentle or too rough. After years of Dana White, Lorenzo Fertitta and Marc Ratner trekking to Albany for ultimately nothing, it's time to turn those hands into fists, and use those fists to plant one right in the kissers of the unknowing public, the mainstream media and the idle legislators who think that no pro MMA in New York is what their constituents want.